Central Plains junior cornerback Lawson Oeser stepped up in key spots as a freshman, notably as a running back in a road win versus a ranked Otis-Bison team. Last year, Oeser played in just seven contests because of injury, one of several Oilers who missed significant time because of health issues. Oeser finished the season with just 11 tackles. This fall, Central Plains opened the season versus Ness City. The 5-foot-7, 145-pound Oeser matched up against Ness City’s 6-2, 220-pound senior tight end Andres Rios, an excellent player. “That looked like David and Goliath out there,” Central Plains coach Chris Steiner said. Ness City went at Oeser for three plays, and he made the play each time. Oeser is a strong tackler and has a vertical of more than 30 inches. Central Plains held off Ness City, 30-14, and Oeser helped limit Rios to five catches for 47 yards. Overall, the Oiler pass defense held Ness City to 13 of 25 passing for 138 yards with a touchdown against three interceptions. Oeser can deadlift more than 450 pounds and had perfect attendance in the weight room this summer. He has 63 tackles and an Oiler-best three fumbles recovered. Oeser’s performance, return from injury and skill set has encapsulated Central Plains’ dominant defensive year. The athletic, healthy Oilers, are 10-0 and ranked first in Eight-Man, Division I. Central Plains has allowed just 22 points (2.2 points a game), easily the best scoring defense in eight-man football – and on course for tops in recent state eight-man history. Since 2009, just eight eight-man teams have permitted less than 100 points in a full season. Two teams have permitted under seven points a game, both squads that won state crowns. Two years ago, Hanover finished 12-0, won Division II and permitted just six points a contest. In ’12, Ness City finished 13-0, captured Division I and allowed 5.5 points a game, according to Prep Power Index archives. Central Plains has posted eight straight shutouts, including a 50-0 rematch win versus Ness City in the Round of 16 playoffs last week. This Friday, Central Plains travels to defending state champion Hoxie (9-1) for the quarterfinals. “Our defense is really based on trust and everybody doing their own job, nothing more, nothing less, and they really buy into that deal, and we’ve just done a real good job,” Steiner said. Hoxie, like several other teams this fall, significantly outweighs the Oilers, especially with its senior line of Taye Washington, Colton Heskett and Jarrod Dible. Washington is over 300 pounds, Heskett and Dible more than 200. “Their size is very intimidating, and they use it well, and they have got some good kids that are strong,” Steiner said. Central Plains went 9-2 last fall and was fifth in all of eight-man with 11.1 points allowed. The Oilers graduated their top-six tacklers. Central Plains’ biggest defensive starter is senior quarterback/safety Myles Menges at 6-4, 202 pounds. Menges missed three games on defense in 2017. Up front, senior Mason Doll (6-2, 197) starts at nose guard. Doll and Menges are second-year transfers from nearby Ellinwood. Seniors Brett Liebl (6-2, 195) and Grant Heldstab (6-1, 182) are at defensive end. Liebl would have started last year but played just five games because of injury. Liebl leads eight-man with 15.5 sacks. Senior Alex Hickel (5-11, 191) is at linebacker. He was out two contests last year. Oeser and junior Jerred Bieberle start at cornerback in the 3-2 defense. Steiner has long advocated a “bend but don’t break” mantra from his defense. He understands the 3-2 has “some holes” and offenses will make some plays. Steiner has always focused on having six players to the football. Collectively, from ’14-16, Central Plains permitted just 11.7 points a game, tops in all of eight-man. But this year has been different. The Oilers have forced 2.2 turnovers a contest and are plus-15 in turnover margin, numbers that are improvement over last season, but still represent the program’s second-worst defensive numbers in the last six seasons. However, Central Plains already has 30 sacks and 66 TFLs – both easily the program’s best in the last six years. “We have had some games where we have hadn’t had those even moments of bending,” Steiner said. Senior cornerback Devin Ryan and Heskett were the only two Kpreps first team all-state non-specialists in Division I who returned for 2018. Ryan had 52 tackles and two interceptions in 2017 and has 51 stops with a team-high four INTs this year. He calls the defense, rare for a cornerback. All eight starters have played in 10 games, except Ryan. He has missed one contest. Offensively, Ryan played quarterback as a sophomore and threw for a 32/3 TD/INT ratio. Before last year, Menges moved to the Claflin area. Steiner played both quarterbacks, and Steiner said he “just wasn’t ready to give the reins away.” Halfway during the season, Ryan approached Steiner. Ryan, a receiver, will sometimes help with offensive play calling and the two push each other in practice. Steiner called the relationship “amazing.” Ryan, an outstanding point guard, is another great athlete in a long line of siblings, including older ones Michael and Janae, and younger sister, Emily, the reigning Kansas girls’ basketball player of the year. “I know a lot of 5A, 6A schools have had problems when guys have moved in, and they have changed guys around, and we have never had a problem with those two guys,” Steiner said. Central Plains, which consolidated traditional powers Claflin and Quivira Heights before the 2011 football season, has annually been one of the top eight-man programs with at least nine wins every year since 2013. Central Plains finished 13-0 in ’14 and won the Eight-Man, Division I state title against Hanover. The last three falls, Central Plains has lost to Spearville in the Round of 16. Steiner is a Claflin graduate and played on state championship teams. Dustin Robison and Steiner’s son, Bryce, are veteran assistant coaches. Multiple starters have ties to past Claflin squads. Unlike many programs, Central Plains does not do a team camp in the summer. Instead, Central Plains often has intra-squad scrimmages and forms the trust through summer workouts. Four captains draft teams for summer workouts and attendance is tracked through the whole summer. The team that has the highest attendance gets less conditioning at the end. As well, uniforms, numbers and equipment selection is all based off summer attendance. “If some kid doesn’t show up, it goes back to their team captain,” Steiner said. Heldstab has especially emerged. He comes from a large family and wasn’t able to play as a freshman. He had 31 tackles last fall and leads with 110 stops and 16 tackles for loss this year. “He’s still a little raw at times, just because of a lack of reps,” Steiner said. Central Plains has enjoyed long-armed, quick and rangy defensive ends and Heldstab fits the mold. Teams often run away from Liebl, which helps Heldstab. “He’s kind of my prototypical defensive end that I like to have,” Steiner said. Doll recorded 34 tackles in 2017 with 83 stops and 13 TFLs this fall, and like, Heldstab is quick off the ball. Liebl, all-state in football, basketball, tennis and powerlifting, is known for intelligence, too. Steiner said he is sometimes more cautious than Heldstab or Doll and will watch for the screen or jam the tight end. Liebl moved to guard on offense. “When he doesn’t want to be blocked, he isn’t blocked, and he’s so smart, so he knows what’s going on a lot of the time,” Steiner said. Menges has 53 tackles, 40 more than last season, and leads with six interceptions. Hickel and Bieberle each have 66 tackles, at least 22 more than they recorded in 2018. “They just have really clicked well and done well on the defensive side of the ball as far as communicating, and just the time the guys put in watching gilm,” Steiner said. Andale, the No. 1 team in Class 3A all season, has outscored opponents, 499-55. The Indians lead the classification in scoring offense and scoring defense. Among Kansas 11-man teams, only 1A Olpe has permitted fewer points with 44. Andale has had six shutouts and had a running clock in six games. Last season, the Indians earned Class 4A, Division I runner-up to Bishop Miege behind a defense that lowered from 20.3 points allowed two years ago to 11.3 last season. This year, Andale has not forced turnovers at the same rate as 2017, but second-year coach Dylan Schmidt is pleased with his unit’s ability to force three-and-outs. It’s helped Andale be on pace for one of the best 11-man defenses in recent history. Since 2009, only two 11-man squads have permitted less than 100 points in a season and won a state title, according to Prep Power Index. Last year, Smith Center permitted 78 points en route to a 2-1A title, and Bishop Carroll won 5A in 2014 with just 65 total points allowed. “The three-and-outs that we have gotten as just been unbelievably impressive,” he said. “It just seems like our defense runs out there for three or four plays, and we get the ball back, so field position has been a big deal with that. Andale (10-0) plays host to Scott City (10-0) in a marquee 3A quarterfinal matchup. Scott City is tied for second in 3A defense with 67 points permitted with 428 points scored. Since the summer, Schmidt has noted his team’s depth. End Mason Fairchild is a South Dakota commit. His dad, Tim Fairchild, is Andale’s longtime defensive coordinator. Fairchild coached in the only other meeting against Scott City, a 9-6 double overtime loss in the 1991 4A playoffs, a year where Scott City captured the state championship. He still vividly recalls the game, plays and players involved. Schmidt’s first cousin played for Scott City. Ted Easter coaches the defensive line, while Jeff Geist, formerly the longtime Abilene coach, heads up the linebackers. Each of the defensive coaches have 30 years plus coaching experience. Senior Ethan Baalmann and junior Easton Hunter switch off at quarterback and both start at defensive back. Usually one player gets two series and the next one gets the other. Hunter has played some receiver, while Baalmann has seen time at slot/running back. They have played more defense this fall compared to 2017, part of multiple Indians that start on both sides. Sophomore Cayden Winter, a wrestler and good athlete, is key on the defensive line, along with senior Garrett Simon, junior Carson Fair and Mason Fairchild. Schmidt said coach Fairchild “really subs a lot of guys in.” Like traditionally strong Andale defenses, the Indians do a great job of flowing to the ball and team tackling. Cornerback Scotti Easter and Winter each recorded eight tackles in last week’s win against Chapman. Linebacker Mac Brand has played well defensively and had a rushing touchdown last week in a 66-22 win versus Chapman. Sophomore Eli Rowland, at defensive back and running back, collected an interception, had 11 rushes for 158 yards and 40 kick return yards. Like other positions, Andale has great depth at running back with multiple players, including Sawyer Simon. Easter has led the team in tackles with around 70 stops and has three interceptions. “It’s just one of those deals where we just have a lot of quality guys, and it just seems like each week somebody different stands out, so that’s fun,” Schmidt, an Andale alum and former assistant coach, said. In Week 9, Andale had its closest game of the year in a 35-13 road win versus Cheney, a squad that won just two games. Andale led 20-0 at halftime, and Schmidt was not pleased with the team’s second-half performance and had a team meeting. In the last two weeks, Andale shutout Halstead, 35-0 and then defeated Chapman. Halstead averaged 34 points a game, Chapman 33 when the teams did not play Andale. “I have been really happy with the last two weeks, to be honest,” Schmidt said. “I thought Halstead had a heck of a football team in terms of being physical and getting after it, and to win that, 35-0, that was awesome. And then I thought we really played well last week against Chapman." 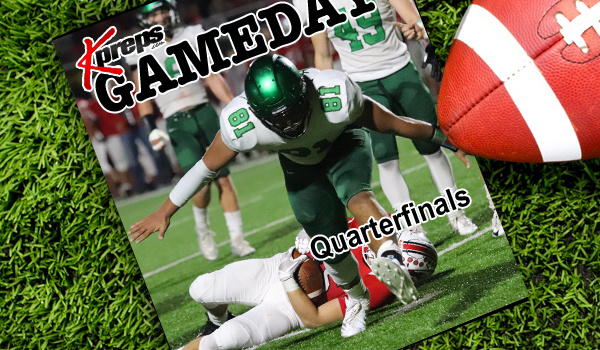 Derby is one of three undefeated teams left in 6A and plays host to 9-1 Topeka High in a 6A quarterfinal contest. The Panthers lead 6A with just 74 points allowed. Derby continues to threaten the all-time record for fewest rushing yards permitted in a season. The 11-man mark is 345 yards set by Ellinwood in 1979. Two weeks ago, Derby limited Lawrence to six rushing yards and had permitted 163 rushing yards in the first nine contests. Last week against Dodge City, Derby had a 54-7 victory. Last season, Derby returned just one starter, Alex McGill, who suffered a season-ending injury in Week 1. The Panthers advanced to the 6A state title game but permitted 27.3 points. This year, a much more experienced Derby defensive unit has dropped that to 7.4. No 6A team has finished a season permitting less than 100 points since Olathe East allowed 86 in 2008, according to Prep Power Index. That is the only such season for a 6A school since 2006. Issac Keener has 20 tackles for loss. Keener suffered a season-ending injury last fall and didn’t play in the state title game loss to Blue Valley North. Migc Aiyanyor has been a key transfer from Salina Central. Defensive coordinator Mitch Pontious runs the unit that has had big seasons from Dax Benway, Cade Lindsay, among others. Coach Brandon Clark is 114-36 in his 13th year with Derby. Last season marked the most points allowed per game since 32.8 in 2010. His best scoring defense before this fall came in 2012 at 11.4 points permitted a contest. For many years, the Casey family has delivered high-level individual seasons on the boys’ and girls’ side for Plainville. Justin Casey is a veteran Plainville assistant football coach and has had an opportunity to coach his brothers, Andrew, and currently Jared. Jared Casey, one of the state’s top juniors and the youngest of the Casey children, has 139 carries for 837 yards and 13 rushing TDs. He also has 17 catches for 275 yards and two scores. Casey leads the team with 78 tackles and is second with 11 TFLs. On Friday, Plainville (8-2) plays host to Elkhart (9-0) in a Class 1A quarterfinal contest. Andrew Casey gets married on Saturday, and the family is expected to hold a rehearsal Friday afternoon, have the game Friday night and then the wedding Saturday. Andrew Casey is the Plainville Recreation director and his fiancé is also from Plainville. Additionally, the Casey’s sister, Amy, was in a serious car accident very recently where the car caught fire. Amy was pulled to safety and is stable condition. Plainville has captured four straight home playoff wins the last three years and has not lost a home playoff game since 2011. That includes a first-round home 49-6 playoff win versus Elkhart two years ago, the only matchup between the schools, according to Kansas Football History. Hodgeman County (9-1) travels to St. Francis (10-0) in an Eight-Man, Division I playoff game that has been moved to Saturday afternoon because of inclement weather and travel concerns. Saint Francis is 4-0 in home playoff games since it bumped to the eight-man ranks before the 2014 season. The Indians have not lost a home postseason contest since 2008. Hodgeman County has played very well in long road trips. Jetmore to St. Francis is 210 miles. Since the start of the 2015 season, Hodgeman County is 10-5 away from home. However, the Longhorns are 6-1 in trips more than 100 miles one-way. The only loss was the 54-48 Division II state championship loss to Hanover in Newton, a neutral site, last fall. The last true road game loss of more than 100 miles for Hodgeman was to St. Francis with a 70-24 first-round playoff defeat in 2015.